lend me your ear because I saw these folks on India Street while getting lunch. 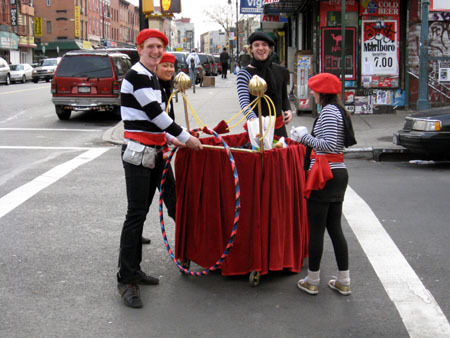 I’m not too sure if they’re supposed to be Frenchmen or mimes. I am leaning towards the latter because only someone from the left bank would conduct their Saturday grocery shopping with such style. LibertÃ©, Ã‰galitÃ©, Chariot d’Ã©picerie ou Famine! P.S. : Yes, I know these folks were participants in the Idiotarod.